With HVAC experts at our disposal and a customer-first approach, our appliance repair Los Angeles company ensures dependable and professional services. Get in touch with us if the heating system is not working as it should. Call us now if you’ve got troubles with the AC. Not only do we cover heating & air conditioning repair Los Angeles needs but are at your service for maintenance too. Be prepared to deal with AC problems by keeping the number of Magic Appliance Repair Los Angeles handy. When the unit fails to run as it should, remember that help is only a phone call away. We always choose the professionals we do business with. Rest assured that only experienced and highly qualified techs will be assigned to your job. Trained to fix heating and air conditioning units of all brands, the pros have the required skills to diagnose and repair all models. Is the system failing to distribute cold air in the room? Is it broken? Does it make unusual sounds? Having troubles with the furnace? Irrespective of the brand you have and the problem you are faced with, call us. Each and every air conditioning and heating Los Angeles pro is certified, well-trained, and experienced. When you request service at our company, a tech is dispatched as soon as possible and comes equipped to troubleshoot and fix issues with your unit. Sometimes, all these systems need to operate at peak efficiency is parts replacement. With a good number of spares in their truck, the techs are able to replace any broken or worn part that causes troubles. The best way to avoid common issues and thus emergency heating and air conditioning repair service in LA, California, is to schedule maintenance with us. Not only regular upkeep prolongs the lifespan of the systems but ensures the quality indoor air too. So reach out to us if you want to have a unit that works at its best and doesn’t contaminate your environment. We will be more than happy to oblige. 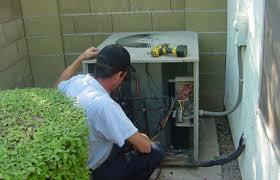 We are at your service if you have troubles and seek a pro to provide Los Angeles heating and air conditioning repair. Give us a call for all your needs today.